The world of automotive manufacturing faces a troubling trend: while vehicle efficiencies increase, so does the pollution created during the production process. This is thanks in large part to the materials that go into the batteries, which are rarer than traditional materials. The increase in pollution sunk cost underlines the fact that manufacturing processes need to evolve with the new age of energy as well. A closer look at this trend reveals that in the case of the Volkswagen Golf, the overall percentage of its carbon footprint left by production has risen from 6 percent in 2000 to a staggering 22 percent in 2014. 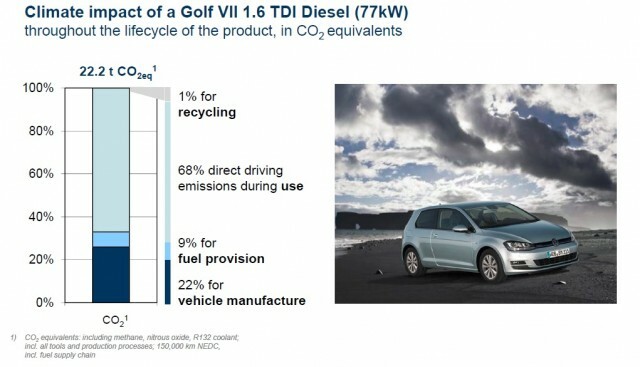 It is important to note that this statistic is based on the most fuel efficient model of the Golf. The German car maker is dedicated to addressing this more elusive topic, and has accomplished its first goal in its pursuit. Already this year, the company has reduced its total production of waste – a combination of carbon emissions, energy and water usage, and waste and solvent emissions – by 25 percent. They also plan to continue this trend, with a goal of reaching 45 percent by the year 2025. As is the case with most efforts to improve efficiency, the goal was accomplished through the aggregate of many small changes: 5,300 to be exact. Many times we think of efforts to reduce emissions as large, singular actions, however the most effective strategy is to look at every link in the chain. This mindset change by Volkswagen wasn’t solely environmentally motivated; the company has reportedly saved $145 million over the past six years by revising its production methods. This is an important fact, as it may entice other manufacturers to improve their methods as well. When companies’ profit motives are in line with bettering the planet as a whole, the decision becomes easier.